Rize | What's my banks interest rate? What's my banks interest rate? Let us shed some light on your interest rate. 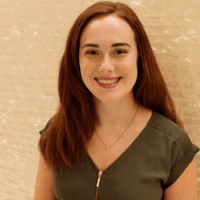 According to the FDIC, the average savings account has a pathetic 0.06% APY (annual percentage yield, otherwise known as interest rate), and many big banks don’t even offer that much. 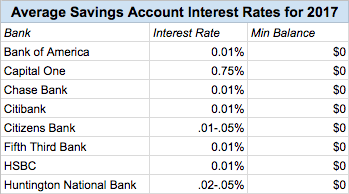 If your current savings account interest rate is 0.01%, it might be time to switch savings accounts. To put it in perspective, if you have $10,000 your Rize account, which earns 1.16% APY, then you would make an extra $116 in interest each year! 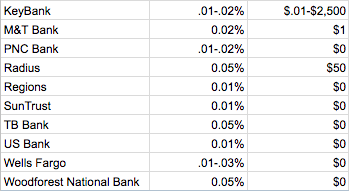 With a 0.06% APY, you would earn a measly $6 (yes, six whole dollars). Make sure to do your research when switching. Some things you want to keep an eye out for are: Minimum opening deposit, balance requirements, maintenance fees and other fees. If you’re considering switching to an online savings account, you’ll most likely not pay fees. For example, with Rize, there are no minimum deposits or fees. Luckily, we did some research for you. Is your bank on here? 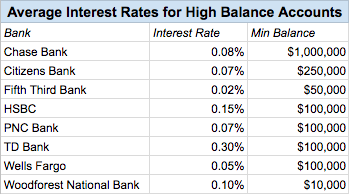 As you can see, interest rates are low, even if you have a high balance in your savings account. How will my interest rate change in the future and what should I do? Make the switch to a savings account with a better interest than .06%. The Fed has made an additional hike in December, and policymakers are forecasting three rate hikes for 2018 as well. What does that mean? Well, these spikes might impact the average savings account interest rate you can earn at banks and credit unions...but not by much. These changes affect consumers slowly, so don’t expect a big change from big banks anytime soon. However, you may see the interest rates for online savings accounts increase faster. For example, Rize passes ALL of the interest back to you unlike others. Rize is one account to set, save, and track all of your financial goals, so you pay yourself first. From an emergency fund to a life-changing vacation, Rizers automatically save for goals they care about with the help of a high interest rate and Power Ups. Rize provides a 1.16% interest rate with no fees or minimums. Instead, we operate on a “Pay what you want” model, so you can pay anything from $0, $2 or $4 a month...the choice is yours. We only make money if we’re actually making your life better!